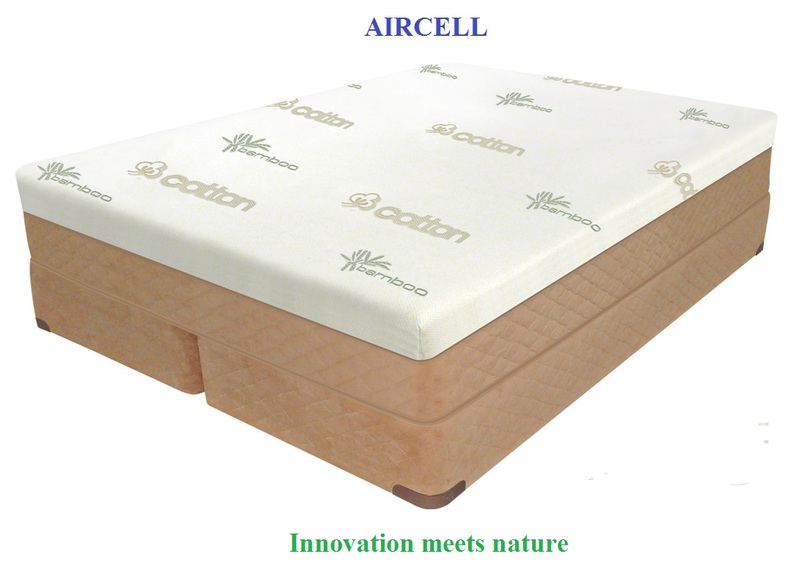 The Air-Cell™ is the best of all worlds, all-in-one great design: Air, Natural Latex, Memory-Cell®, Wool, Cotton and Bamboo… Who say's you can't have it all! Infinitely adjustable: with a touch of a button, you can find that perfect level of Air Support, so you can enjoy a great night's sleep. 2-In-1 duo firmness - Memory-Cell® & Natural Latex reversible insert: both materials contour to the body to promote proper support and pressure reduced sleep. The reversible insert is surrounded by a Wool Moisture Barrier: wicks away moisture in either a warming or cooling manner - maintaining warmth in the winter and coolness in the summer. Natural FR properties, antimicrobial, sustainable & biodegradable. Exquisite, super soft Cotton & Bamboo cover panel. Both are a renewable & sustainable, Earth-friendly material. Multi-Zoned support: separately designed zones for proper sleep alignment and head-to-toe support and comfort. The Air-Cell™ carries the prestigious Specialty Sleep Association's Environmental Safety Seal; a first among all high visibility national brands. Every component from top to bottom features third-party certification of it's positive impact on the environment. 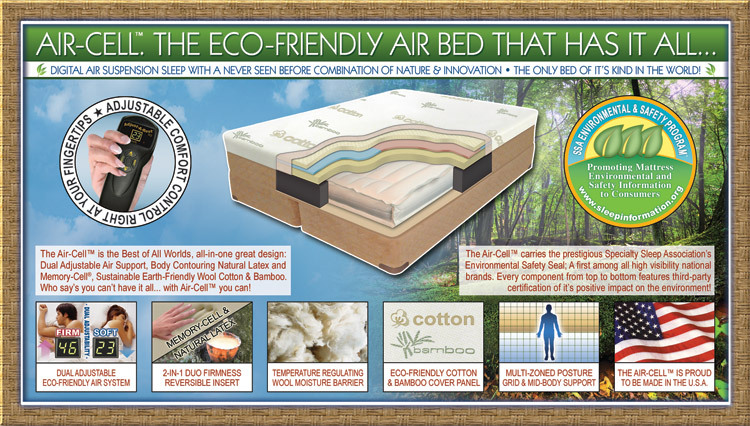 A mattress that is "Great for you & great for our environment!". Genuine European Vulcanized 25 Gauge Latex with Cotton Canvas Cover. Thicker & more durable, the original Euro design of the Pearl Chamber provides a full 6" of air suspension for pressure reduced sleep. The vulcanized process is similar to that of tire mfg. and virtually eliminates all seams. The material actually flows together & becomes a one piece construction. 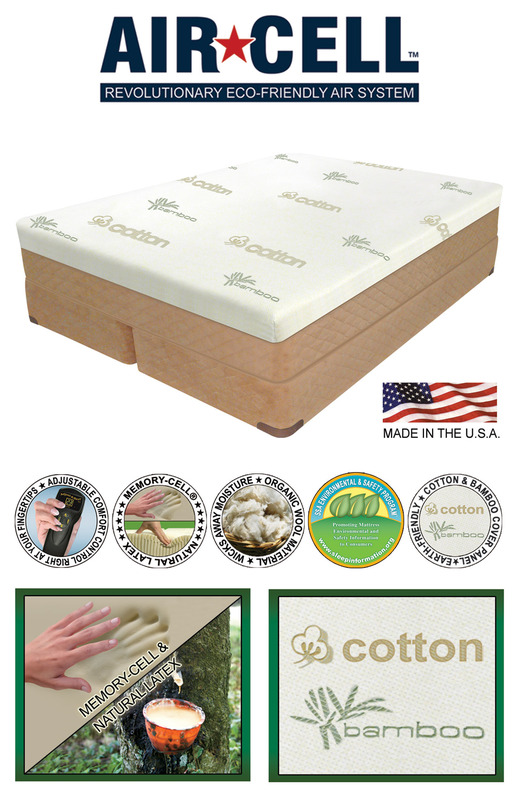 The natural cotton material is adhered chemically to the latex offering a soft texture and eliminating air leakage. While other I-Beam construction offers only one side sealing, the dual side "I" Beam is actually two layers of canvas with two layers of rubber bonded together joining the top and bottom of the Air Chamber. Where this "I" Beam meets either the top or bottom, the canvas/latex layer flairs out each way offering twice the holding power for extra strength and years of durable use. Easy to use barrel connector locks in place to prevent accidental disconnect during use and is not rendered ineffective by dust or pet hair commonly associated with clip on connectors. • 4 Function Ergonomic Controls Featuring 4 primary functions, including sleep memory and bed made ready auto fill mode at the touch of a button, elegant and ergonomically designed Luxury Support Ultra dual controls are user friendly with easy to read LED digital readouts. • LED Digital Readout Versus hard to read black LCD digits displayed on a grey background offered on competitive models, the Luxury Support LED (Light Emitting Diode) design allows you to clearly see a read-out of the firmness level you have selected even in a darkened room. • 50 Comfort Settings While most competitive hand wands offer 20 or fewer arbitrary and often irrelevant set point options, dual Luxury Support Ultra hand controls offer 50 scientifically accurate comfort set points. • Automatic Bed Fill The Luxury Support Ultra Digital Air controller features an automatic bed fill mode that allows you to give your bed that made ready look at the touch of a button. • Pneumatic Pump Versus competitive models using unsophisticated electric blower pumps that are underpowered and less efficient, pneumatic air processors facilitate inflation of Luxury Support air chambers to much firmer levels and provide you the broadest spectrum of adjustability. • NOTE: This Digital Air Inflator MUST BE acclimated to room temperature for 24 hours prior to attempting to operate. Failure to do this may result in the Digital Air Inflator not functioning properly. •The Adjust-A-Rest™ SQ Air Inflator has a new Whisper Quiet Design, featuring a sound dampening internal structure which means virtually silent operation. An improved design featuring a suspended pump motor and rubber feet which helps eliminate vibrations while thick insulated walls insulate the already quiet motor noise. •4 function ergonomic controls featuring 4 primary functions, including sleep memory and bed made ready auto fill mode. •The Adjust-A-Rest™ digital LED controls are user friendly and ergonomically designed. The LED (light emitting diode) design allows you to clearly see a readout of the firmness level you have selected even in a darkened room. •50 comfort settings. While most competitive hand wands offer 20 or fewer arbitrary and often irrelevant set point options, the Adjust-A-Rest™ dual digital hand controls offer 50 scientifically accurate comfort set points. •Automatic bed fill. The dual digital hand controls feature an automatic bed fill mode that allows you to give your bed that made ready look at the touch of a button. •Adjust-A-Rest™ motorized air pump processors facilitate inflation of air chambers to much firmer levels and provide you the broadest spectrum of adjustability versus competitive models using unsophisticated electric blower pumps that are underpowered and less efficient. •NOTE: This Digital Air Inflator MUST BE acclimated to room temperature for 24 hours prior to attempting to operate. Failure to do this may result in the Digital Air Inflator not functioning properly.